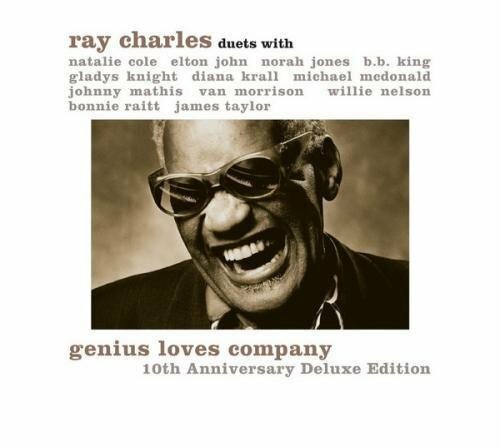 In celebration of the 10th Anniversary of its release, Concord Music Group in conjunction with The Ray Charles Foundation and Hear Music will re-introduce this treasured album in a special 10th Anniversary Deluxe Edition. Genius Loves Company, originally released in 2004, is one of music's most inspirational and historically significant albums of all time. With over 5.5 million copies sold, Ray Charles final studio album is certified multi-Platinum, Gold or Silver in numerous territories around the world. It is the Winner of eight GRAMMY Awards, including Album of the Year and Record of the Year in 2005 (tied with number of GRAMMYs won for Norah Jones Come Away With Me and Michael Jackson s Thriller). This 10th Anniversary Edition includes the original album with 2 bonus tracks; DVD with mini-documentary of the historic sessions and interviews with guest artists from then and now; New expanded booklet with updated liner notes and photos. The DVD: The Making of Genius Loves Company features interviews and in-studio footage with various guest artists and producer Phil Ramone, the documentary chronicles the making of Ray Charles critically acclaimed and final studio album. The DVD also includes Norman Seef's historic photo session with Ray Charles.